My link to Haiti from Brixton is a shop in Brixton Market selling ‘spiritual products’. I made a proposal for the 3rd Ghetto Biennale in Port-au-Prince, Haiti, to research connections to salt in Vodou, the national religion, which also doubles up as a cultural conduit and way of life for many Haitians. In Kreyol, the national language, there is a saying ‘Zombi pa goute sel’: Zombies do not taste salt, as the salt wakes them up. I had read about (and tried out) salt being used in protection and cleansing rituals for people and spaces. And I had heard of ‘Goute Sel’ in another context, one of a political awakening: it was the name of a literacy program ran by Ti Legliz, the liberation theology movement of local churches which educated and radicalised the peasant population in the 1980s, against the Duvalier dictatorship. On arrival, I planned to try and track down the location of Grande Salines, and the remnants of Goute Sel, if I could. Meeting the Atiz Resistans artists at the Gran Rue, where the Ghetto Biennale takes place, and the other artists who had come from all over world for the event, relationships and negotiations began to develop, and other debates over markets. The Haitian artists make work for an art market which is hard for them to access, but many of the non-Haitian artists were doing socially engaged, ephemeral, or performative work which did not have a market-value as such. Placing such work in this context, and negotiating over its making, meant for me a process of reflecting on how it would be perceived. In John Akomfrah’s ‘The Unfinished Conversation’, Stuart Hall describes how placing himself into the context of Oxford University, he ‘had to go through it’: by being in a place where he could never fit in completely, he was forced to consider more intensely his own identity. Juxtaposing these different approaches and types of art practice into the Gran Rue sharpens the need to question intentions and perceptions of artworks. 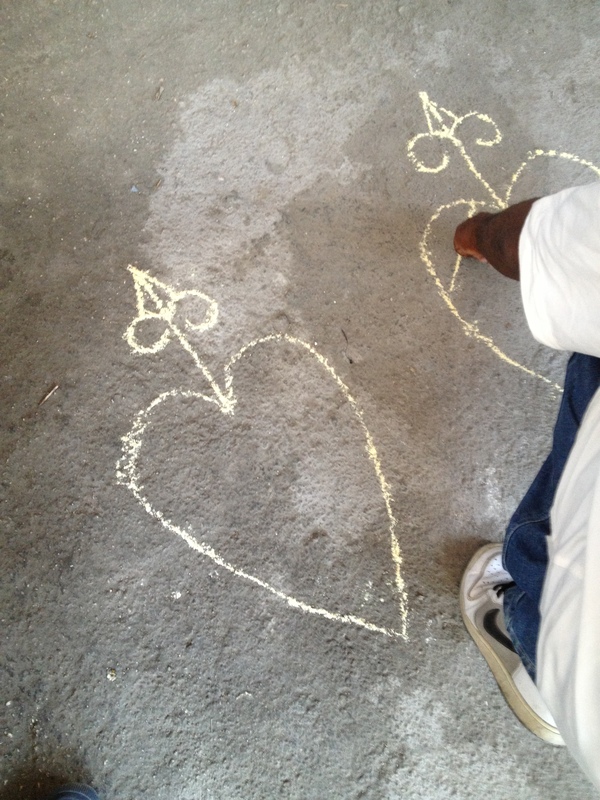 As I began to learn the art of making Veves, a Vodou ritual in which patterns are drawn onto the ground with cornmeal, I asked the Haitian artists I was working with their views of making these as a part of a performance. Mabelle said she had only ever made a Veve before when the spirit was in her. Papada, the local Vodou Houngan (priest) and an artist as well, said I needed to be aware of the spiritual requirements: he would need to introduce and bless each Veve, and I couldn’t use salt. When I explained my personal ancestral links to salt, he said in that case it would be okay with the spirits. I think at this point I realised that we were complicit in the ersatz theatricality of this invented hybrid ritual-performance. There was an tacit acknowledgement, which I found interesting considering my role as outsider western artist, that this was about the creation of a spectacle for the audience. It then became about a negotiation of authenticity, wearing the Mambo dresses, wearing or not wearing shoes, silence, control, the perfection of the Veve symbol. golden opportunity, and that the pans are still going, despite salt now being sold in the market for a few gourdes. I got my sack of salt and we drove back, and with the help of the ladies of the Gran rue (and one gentleman) made some small sacks emblazoned with ‘Goute Sel’. I had a fruitless couple of days searching for the Goute Sel text. Driving around Port au Prince from the National Archives, the building still being rebuilt and everything in boxes, to a cartographic office that couldn’t be found, and a charity that didn’t want to know, I thought about the absence of things. In Port-au-Prince, a city recovering from a devastating earthquake but also years of underdevelopment, some things are very much present, and others are absent. Aid agencies and government slogans are on show, hoardings promising rebuilding, reused USAID sacking covering broken buildings. No one seemed to know about Goute Sel, and no one seemed to want to talk about that part of Haiti’s past. In the end I decided to recreate a page of Goute Sel, an invented page of translation that linked salt in Vodou with the power of waking up through education, a quote from Paolo Friere. This became a part of the performance. So after practising several times and trying on our Mambo dresses, myself and Mabelle created a twin Veve in Papada’s yard, on the opening day of the Biennale. The yard was packed with people and we had to swing our skirts carefully to avoid wiping out the careful work. We had to wait half an hour for Papada to bless the yard and perform the Veve first, and I felt the slowness of making the pattern as our audience watched and the drummers played and Papada sang. But it felt right that the Veve we made was to ‘Kafou’, the spirit of the crossroads. Haiti is a country at a crossroads, and has been for a centuries a crossroads of trade, migration, journeying. It has a troubled and difficult history, but it is also one of finding identity, an identity which mixes cultures and keeps adapting. It’s a place which gets under your skin, and asks to to think about the skin you are in. Afterwards, someone told me that one of the Haitians thought I was a real Mambo and that they saw the performance as a Vodou ritual, not an artwork. In my complicity with the others in creating the spectacle, I was accidentally transformed into the authentic article. Can I be (in Hal Foster’s terms) both an artist as ethnographer and become the subject of the ethnography? Both the tourist gazing and the subject of the tourist gaze? Or is this what George Marcus defines as ‘complicit engagement’, in which there is an acknowledgement of collusion in the act of creation? Working in the Gran Rue, some things get lost in translation, but perhaps what matters is the intention of finding a language that can be interpreted in multiple ways, and still hold meaning to all. Peter Hallward, 2008, Damning the Flood, Haiti, Aristide and the Politics of Containment. 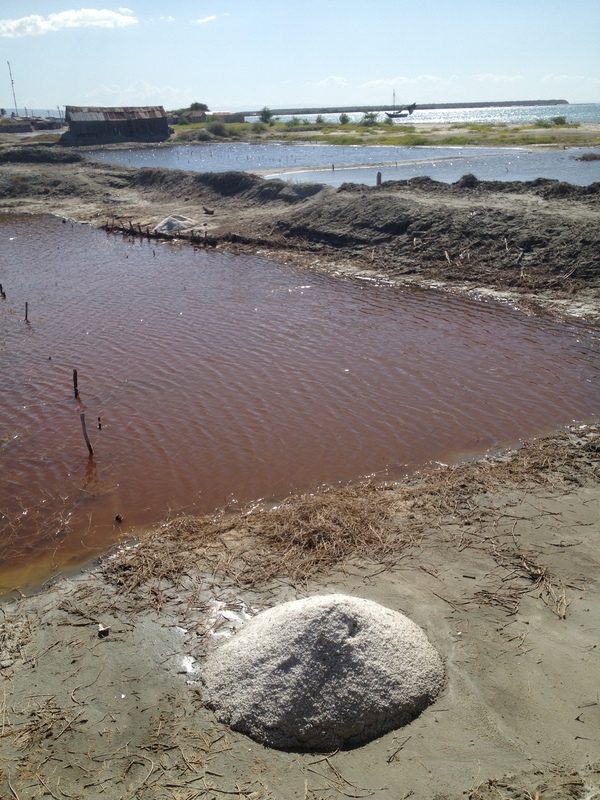 This entry was posted in Uncategorized and tagged 3rd Ghetto Biennale, Goute Sel, Haiti, salt. Bookmark the permalink.